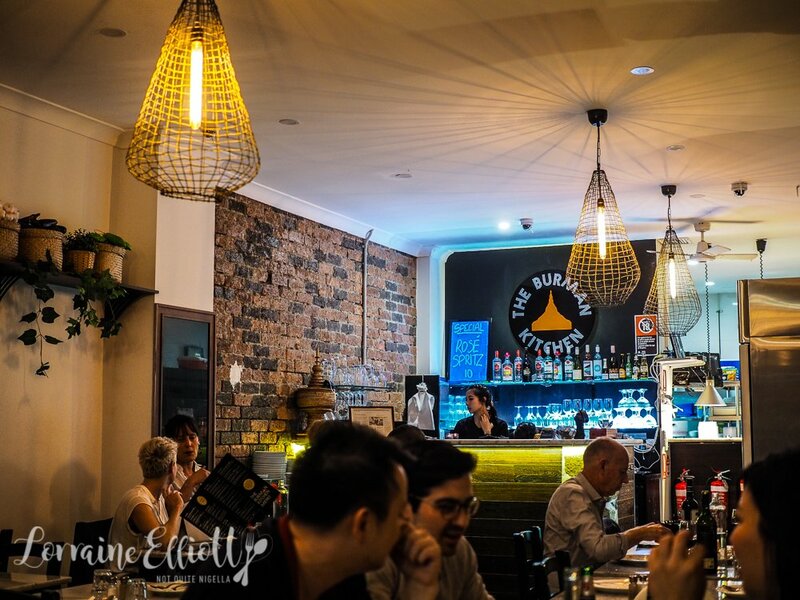 Granville's Burman Kitchen has opened up a branch on Crown Street in Surry Hills. 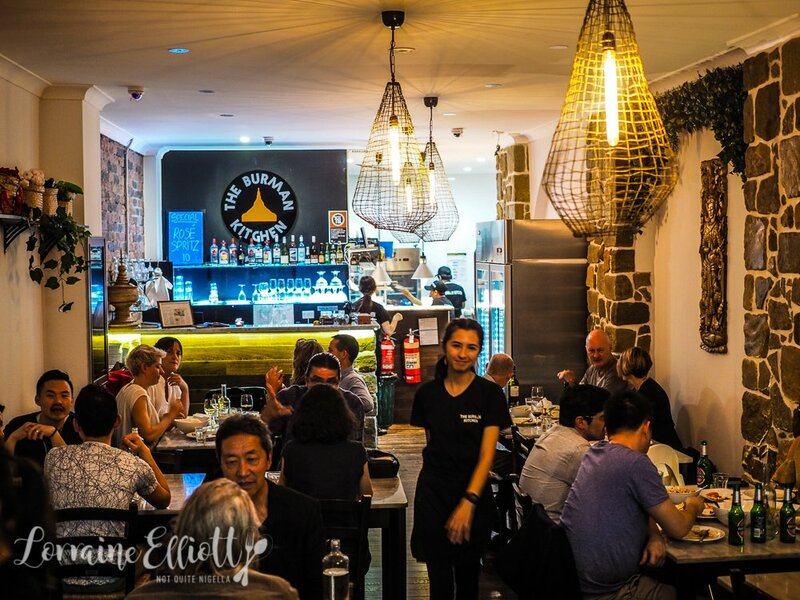 "We are the only Burmese restaurant in this side of Sydney," our waitress says smiling proudly. 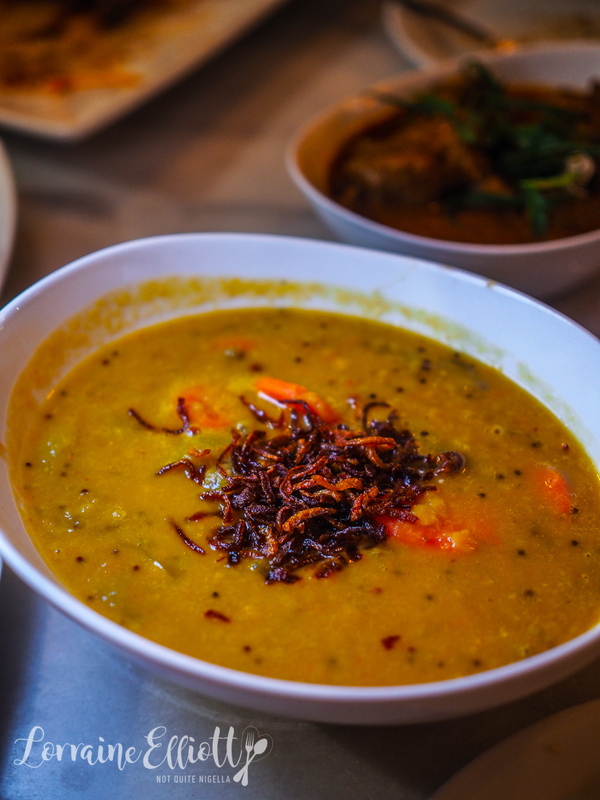 Burmese cuisine has Indian and Chinese influences and dishes like crispy fritters, curries and a preponderance of fish flavourings make up this unique but accessible cuisine. It's Saturday night and Nina and I have gotten inappropriately dressed up for a casual restaurant like Burman Kitchen (warm weather excitement will do that to you). 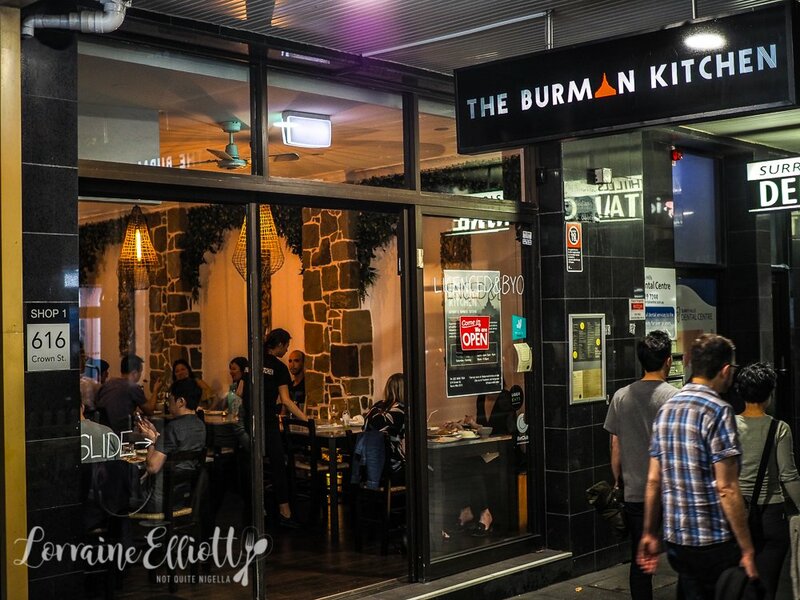 And this evening as I look around Burman Kitchen, many of the patrons are Burmese. It's a popular restaurant and on nights like this it's best to be in possession of a reservation. Service is lovely and friendly although when it gets busy it can be a challenge to get their attention. They recommend some dishes and we go with those. Because there are a lot of fish based seasonings added to things, there aren't a lot of vegetarian dishes on the menu but they tell us that many of them can be made vegetarian with some alterations. 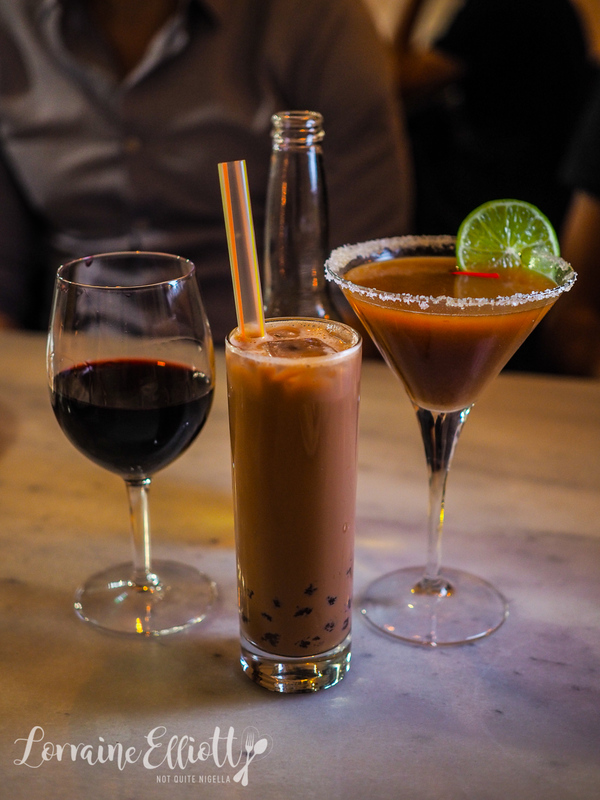 We start with drinks-beer and wine for Garth and Nina and cocktails for Mr NQN and I. I love my bubble tea cocktail with Baileys and tapioca pearls which is sweet and milky. It's one of those dangerously good cocktails that tastes like flavoured milk and then you find that can't walk. Mr NQN has the tamarind and chilli margarita which he really likes. It polarises everyone at the table though. I quite like it although it isn't the flavour for everyone. Although these are called a salad, it isn't so much a salad as it is fritters. 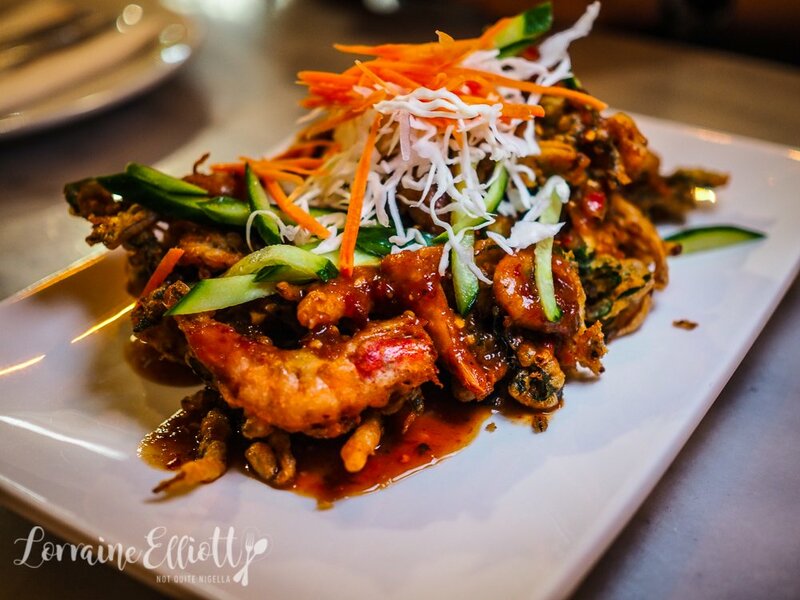 It's a tangle of crispy school prawn and sweet potato leaf fritters that are lightly battered and served with a sweet and sour chilli tamarind sauce, onions, beansprouts and cabbage on top. They're delicious and light and I scoop up lots of that delicious sticky sauce. Then everything arrives at once covering our table with dishes. 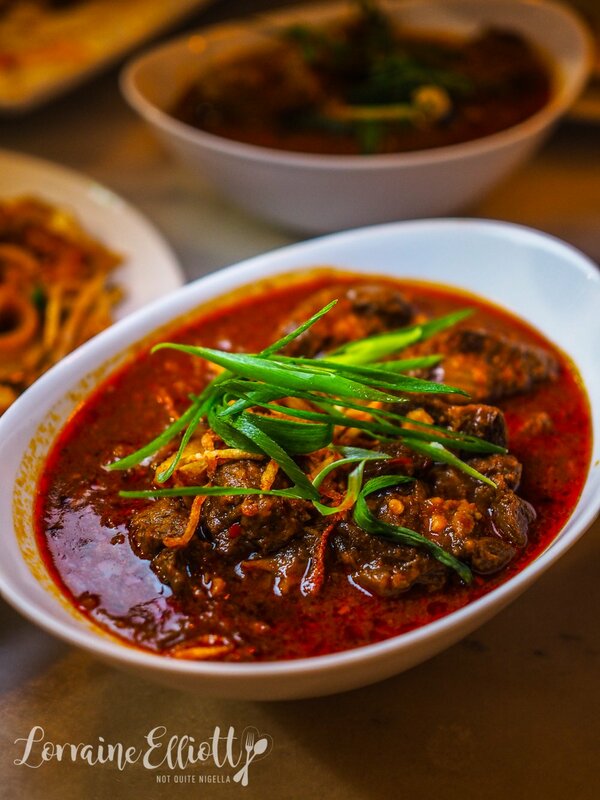 The Burmese beef curry is a rich, thick curry with slow cooked beef with a good balance of spices but what makes this moreish is the soft beef in the pool of thick sauce. Steamed rice also comes with the mains. 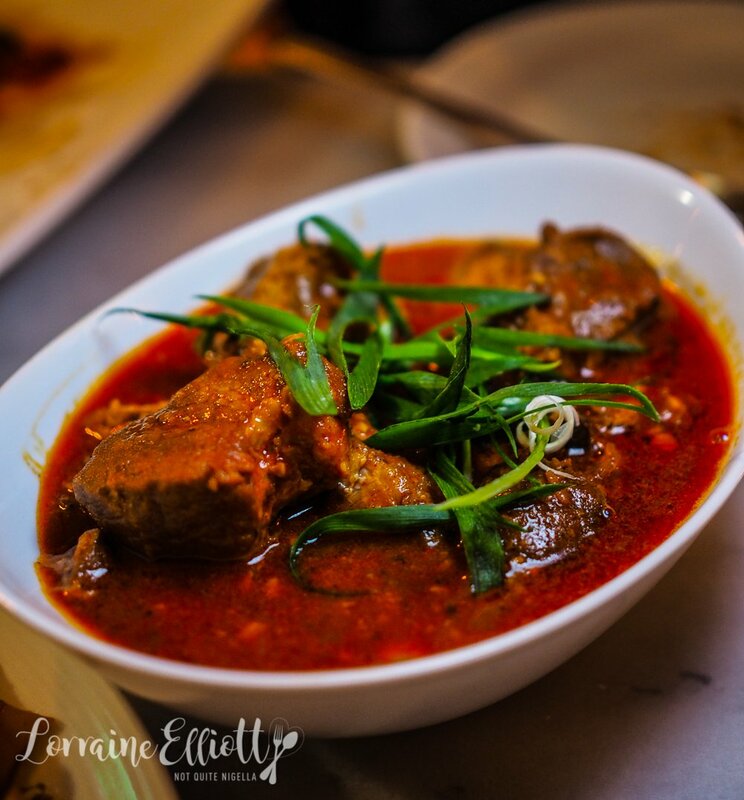 My favourite curry is the mango pickle pork curry which is pork fillets, also slow cooked so they fall apart. The mango pickle gives this curry a unique but moreish quality. It's not like any other curry yet it's not so unfamiliar that it is jarring. Pork is said to be the best accompaniment for Myanmar mangoes and the pickle with garlic, chilli and unripe green mangoes is a popular accompaniment to meat. Quite honestly we didn't know what to expect but when they set down three enormous rice balls our eyes widened. They're balls made with rice, potato and basa fish and shaped into balls. 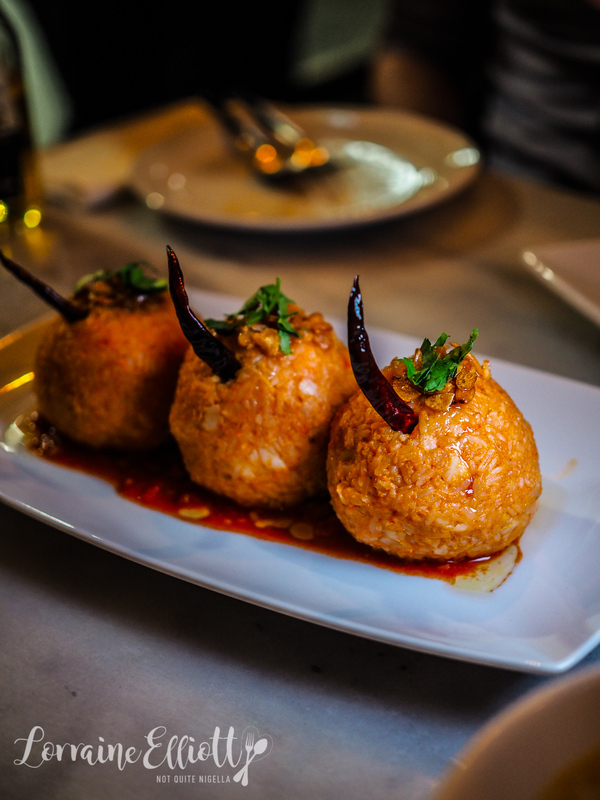 They are served on a base of cooked down crushed tomatoes and topped with a single roasted red chilli, garlic oil and coriander. And did I mention how large they are? They remind me of a seafood risotto but shaped as a ball. We can barely make a dent into it and I'd love a bit more of that tomato sauce. I actually enjoy them with the sauce from the pork curry above too. This was a strong recommendation from our waitress. 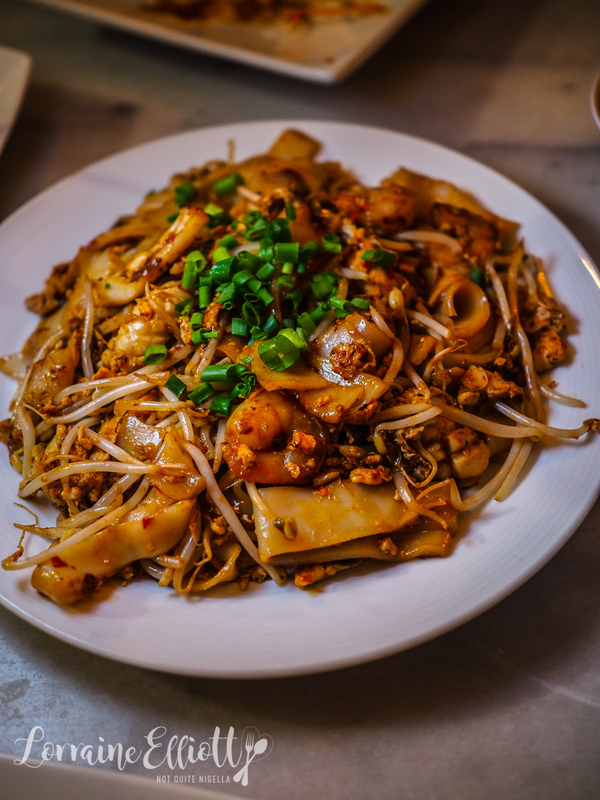 Although it isn't very different from say a Thai seafood stir fry noodle, it's also a crowd pleaser with plenty of prawn, squid and chicken on the large flat fried rice noodles. 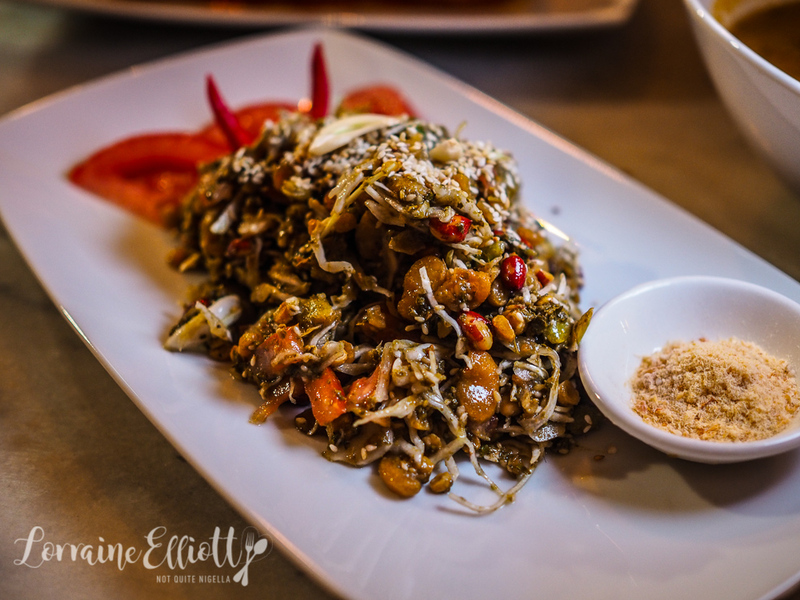 She also really recommended the pickled tea leaf salad which is a fresh, crunchy salad with crunchy peas, nuts, tomato and cabbage with a lemon-fish sauce dressing with sesame seeds, fresh chili, dried prawns and garlic. This is also a bit different from other flavours and shows the uniqueness of Burmese cuisine. Salads are a popular item in Myanmar. In fact there is a popular saying that goes, "Of all the fruits, mango is the best; of all the meats, pork is the best; of all the leaves, laphet (fermented pickled tea) is the best". Nina's choice is the vegetable curry with peas, carrot, pumpkin, okra, eggplant and green beans in a spicy, thick sauce. It's very good and a very large serve too and she can barely finish half of it. By now Nina knows that I have to order dessert no matter how much she disapproves (the perils of dining out with your trainer) but I can't resist shaved ice. 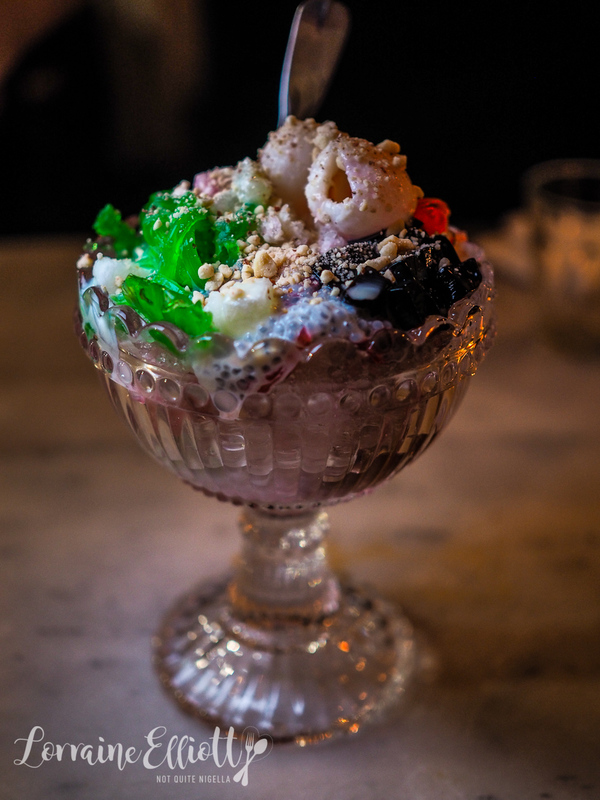 It's conjures up childhood memories of holidays in Singapore eating ice kacang. The Burmese version is equally as delicious but slightly different with dried mango, green and pink jelly noodles, grass jelly, syrup, sweetened condensed milk and crunchy roasted peanuts. I particularly like the dried fruit and peanuts in this. 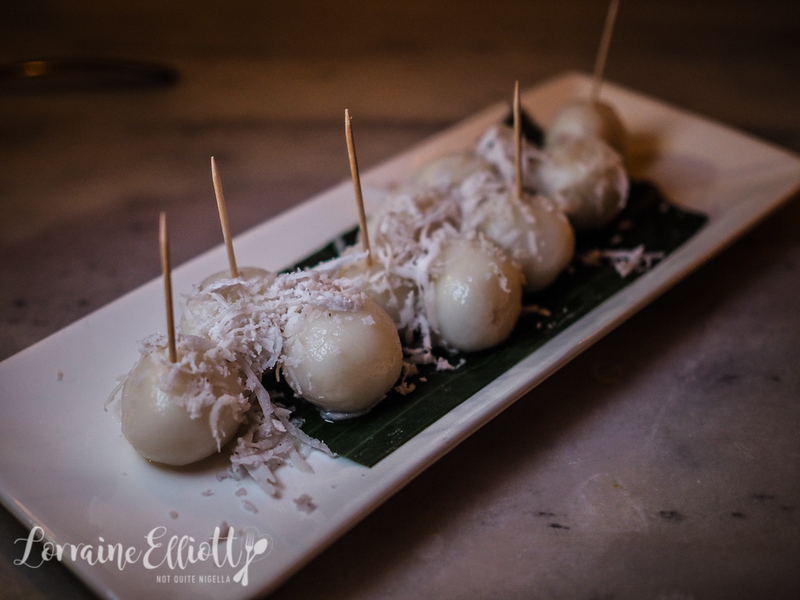 The sticky glutinous rice flour balls are also popular. Pick one up with a toothpick and you be rewarded with a piece of crunchy palm sugar in the centre. And the bill? It's a very reasonable $50 a person considering that we ordered so much and had drinks! So tell me Dear Reader, have you tried much Burman food before or been to Burma? Do you like Asian desserts?